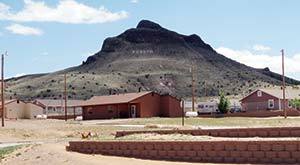 TOP: In the middle of the Hopi Buttes Volcanic Field, Teesto’s topography is characterized by craggy black buttes. BOTTOM: The boundaries of Teesto Chapter have been redrawn several times with the evolution of the Navajo-Hopi Land Dispute. It seems a strange place for a town, amid the choking grey dust and the craggy black buttes rising out of the ground like the castle of Mordor. But Teesto was once a thriving community on the main road between Dilcon and Polacca. At that time, it was more commonly known as Naat'ee'tiin, "Road Going Past." It had a thriving trading post and a couple of other businesses. Everything changed in the early 1960s when Arizona Rte. 87 came through, bypassing Teesto and directly linking Winslow and Hopi. The businesses withered and the road lured the chapter's young people away to work on the railroad or at the Grand Canyon, which was booming in the heyday of Route 66. 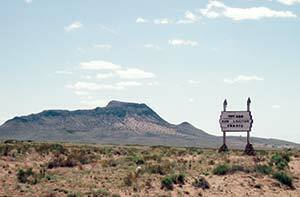 Then there was the settlement of the Navajo-Hopi Land Dispute, which neatly lopped off the top 40 percent of the chapter, forcing dozens of Navajo families -- many with Hopi blood -- to move south. Today, the twin communities of Teesto and Seba Dalkai across the highway seem frozen in time. Hardly anybody has running water, and they only recently got cell phone reception, thanks to a new NTUA communications tower. Ironically, said lifelong resident David Begay, the road has made Teesto more remote. Those who do bother to stop and talk to elders like Begay, 79, will discover an interesting history. This is a town co-founded by Navajo and Hopi refugees. Begay's great-grandparents were some of the original settlers here. They had been part of a Navajo community near Keams Canyon known as Tala Hogan. "A lot of them were really Hopis who had married into the community," Begay explained. "But they were speaking Navajo and practicing Navajo ways. Eventually the Hopis decided they didn't want them there and drove them out." According to Begay, most of the Tala Hogan families relocated to the Jeddito Wash. But later that was made part of the Hopi reservation, and they had to move again. Those who relocated to the northern area of the Hopi Buttes Volcanic Field, where water was more plentiful, had to relocate a third time when a court decision in the 1970s ceded that land to the Hopis as well. But in the early days, before the Long Walk, the Navajo-Hopi families from Tala Hogan met some Navajos in this area and started a peaceful community where both Navajo and Hopi culture was practiced. Everyone was getting along fine, according to Begay, when the Cavalry came through and started rounding up the Dine. "Some of the people took shelter among the Hopis," Begay said, "but they would only accept people with Hopi blood." Begay's great-grandmother, who was Hopi, was able to flee to the mesas, but his great-grandfather, who was Navajo, had to go to Fort Sumner with the other Dine. After the Long Walk, many people came back to the area, which at that time had some good grazing land and farming in the Polacca Wash. Benefitting from the Hopis' excellent dry-farming techniques, the community began to flourish. A day school was built at Seba Dalkai. After World War II started and gas was rationed, it was converted to a boarding school. The school is still there and, other than the chapter, is the only employer here. "I remember there was one guy who was the school's bus driver, janitor, barber and mechanic," Begay recalled. "Now every person has their own job to do, and they complain if you try to make them do something else. But that guy, he never complained." The chapter was created in 1955, but even before that, the community held meetings, recalled the Navajo Times' longtime cartoonist, Jack Ahasteen, who hails from here. "I remember as a kid going to chapter meetings in the corral by the trading post," he recalled. "Everyone would be sitting on the fence." To this day, every chapter has its fence-sitters, but in this case, it was literal. The series of relocations is probably the defining issue in the chapter, said both Begay and Ahasteen. "The people are still depressed and angry about that," Ahasteen said. While some relocatees were provided housing in Winslow, 49 miles to the south, many ended up losing their homes and tried to come back to the chapter, but had trouble getting a homesite lease, according to Ahasteen. Through it all, however, relations with the Hopis have remained cordial, perhaps because so many people are intermarried with them. "People realize it was the government that started the divide-and-conquer scheme to get our resources," Ahasteen said. "We don't really hold it against the Hopis." Back when Polacca had a thriving rodeo, about half the crowd would be Navajo, Begay recalled, and there was a friendly rivalry between the tribes. Name - Either from "T'iis Tso," "Big Cottonwood Tree," or "T'iis To," "Cottonwood Springs." According to local elder David Begay, there was a huge tree behind the trading post. Part of it is still lying on the ground if you know where to look. The area was also known as "Naat'ee'tiin," "Road Going Past." The other main community in this area is Seba Dalkai, "Sand Blowing up the Butte." "A lot of trading went on at that time too," he said. Begay, who is a quarter Hopi, maintains close ties with the Hopi side of his family. Wen we visited him on Monday, his family was just back from a niece's funeral on the Hopi side. "A lot of their ways are strange to us," said Begay. "For instance, at the wake, some of the people will touch the body. A Navajo would never do that. But that's their way, so we have to respect it." This place may look like Mordor, but it has a history of peace and tolerance from which the rest of the world could learn. Hopefully Teesto will be rewarded with prosperity soon.